This is a common shrub in large areas of southern California, lighting up the chaparral in spring and early summer. It is round to dome shaped, up to 5 feet high, dressed with dark green lance shaped leaves. 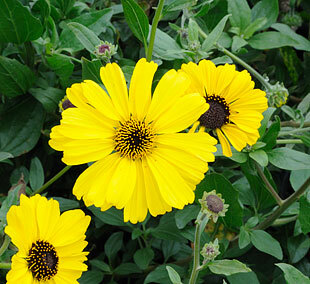 The flower heads are carried singly above the leaves, 2-3 inches broad and colored bright yellow with dark centers. This is a dryland plant, both heat and drought tolerant but demanding a sunny exposure and well drained soil, particularly near the coast. Hardy to 20 degrees F or less.